Fleet Skips provides skip hire, waste removal, and recycling services in Kent and the surrounding towns. Contact Fleet Skips for reliable skip hire and waste clearance services. Based in Dartford, Kent, we guarantee a first-class, friendly service at a price that doesn’t break the bank when you choose us. At our highly regarded skip and waste business, we aim to ensure complete customer satisfaction while managing waste in the most efficient, environmentally friendly way possible. We take pride in the exceptional levels of customer satisfaction we achieve with every job we take on. Your approval is our number one priority, so we work hard to deliver your exact requirements throughout the skip hire experience. Having established ourselves in 2000, we utilise more than 18 years’ experience to provide a first-rate service to the general public, builders, and industrial companies. As we are a fully licensed waste disposal company, you can rely on us to cater for your needs. 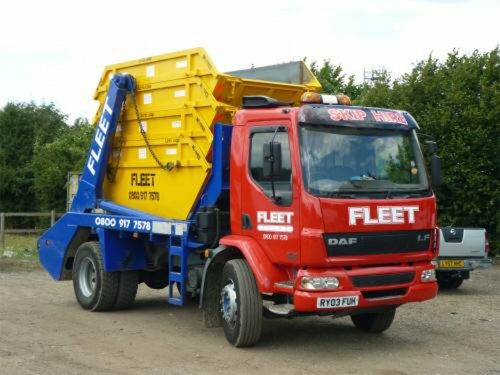 Why Choose Fleet Skips for Your Skip Hire? Whatever the size of your project, we provide a full range of skip sizes for hire to suit all specifications. Our skip hire vehicles are maintained to high standards, examined daily, and serviced every six weeks by our workshop, guaranteeing that they are roadworthy and pollution-free. Contact our skip hire company in Dartford, Kent, to discover more about our skip hire service. Fleet Skips is located in Dartford in Kent, and is ideally situated to satisfy all your skip hire demands throughout Kent and South East London. Our skip hire company reaches clients swiftly and efficiently as our drivers employ state-of-the-art navigation devices and use their local knowledge of the areas we cover. Through years of providing top-quality skip hire services, we have developed our reputation for swift delivery and collection, united with excellent rates and service from trusted and responsible professionals. Our staff have nearly two decades of experience in waste management and strive to exceed all your requirements. We can regulate skip permits from local councils, guaranteeing that your contract runs in a smooth manner and within your time restrictions. We serve many areas within Kent, see our service areas below for more detail or view our skip hire size guide.